In this document we are told that Anne, wife of Joachim, was advanced in years and that her prayers for a child had not been answered. Once as she prayed beneath a laurel tree near her home in Galilee, an angel appeared and said to her, "Anne, the Lord hath heard thy prayer and thou shalt conceive and bring forth, and thy seed shall be spoken of in all the world." Anne replied, "As the Lord my God liveth, if I beget either male or female, I will bring it as a gift to the Lord my God; and it shall minister to Him in holy things all the days of its life " And thus Anne became the mother of the Blessed Virgin Mary. The devotion of St. Anne was known in the East in the fifth century, but it was not diffused in the West until the thirteenth. A shrine at Douai, in northern France, was one of the early centers of the devotion. In 1382 her feast was extended to the whole Western Church, and she became very popular, especially in France. 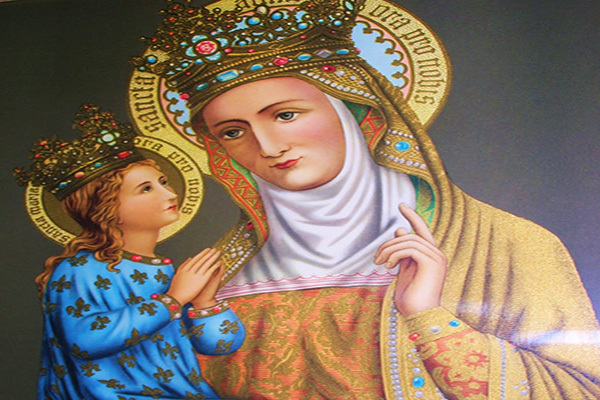 Her two most famous shrines are at St. Anne d'Auray in Brittany and at St. Anne-de Beaupre in the province of Quebec. She is patroness of housewives, women in labor, cabinet-makers, and miners. Her emblem is a door. St. Anne has been frequently represented in art, and the lovely face depicted by Leonardo da Vinci comes first to mind in this connection. The name Anne derives from the Hebrew Hannah, meaning "grace."